Please shorten the plugin's description field. It is customary for plugins to present their human-friendly name and a short description in the "Plugin Manager" page on Jenkins. e.g. the "envinject" plugin has a human-friendly name of "Environment Injector Plugin" and a description of "This plugin makes it possible to set an environment for the builds. ", resulting in a concise entry in the Plugin Manager WebUI (see "example-short-description.png" for screenshot). 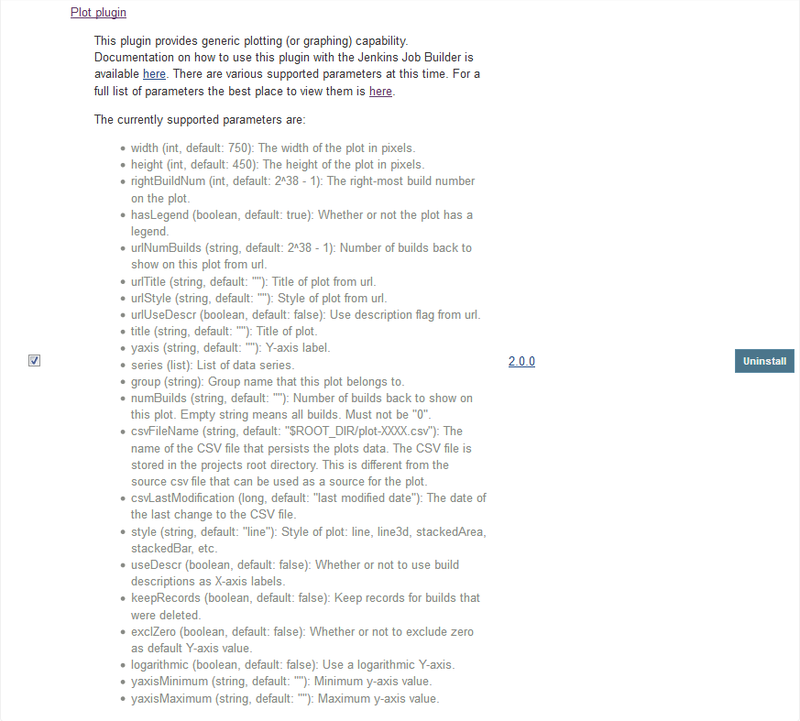 The plot-plugin, however, has a lengthy description which bloats out the Plugin Manager page (see "current-too-long-description.png" for screenshot). While this documentation is useful, it shouldn't be here - a better place for it would either be on the plugin's wiki page or preferably within online help built into the plugin itself. I would suggest that this text be truncated at the end of the first sentence, resulting in something like "suggested-shortened-description.png", and the rest of the text placed in the plugin's wiki page or (preferably) within the online help built into the plugin itself for the Post-build Action "Plot build data". Previous description was too long and was bloating Plugin Manager list. SCM/JIRA link daemon added a comment - 2017-12-20 12:24 Code changed in jenkins User: vgaidarji Path: src/main/resources/index.jelly http://jenkins-ci.org/commit/plot-plugin/6401f9169193c12a971e93c6ae858897ca3d1d8b Log: JENKINS-48537 Move plugin description to wiki Previous description was too long and was bloating Plugin Manager list. pjdarton Thanks for the report. Fixed, will be included in the next release. Veaceslav Gaidarji added a comment - 2017-12-20 12:29 pjdarton Thanks for the report. Fixed, will be included in the next release.